NASCAR suspended Sprint Cup driver Matt Kenseth for two races following an on-track incident this Sunday where he purposely rammed Joey Logano’s race car into the wall at Martinsville Speedway. Kenseth had been angry with Logano following an incident two weeks prior at Kansas Speedway, where a tap from behind from Logano spun Kenseth out of the lead. 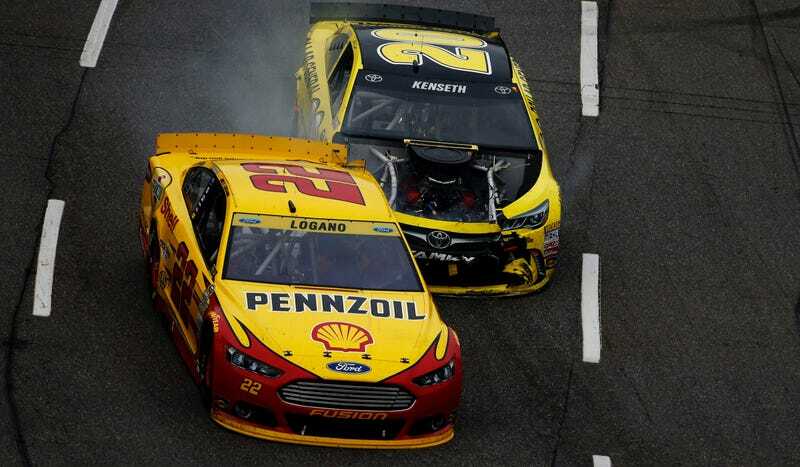 Kenseth swore revenge on Logano after the two nearly collided again at Talladega, but did not act on it then. The next week, Kenseth rammed Logano into the wall at Martinsville. The two were not racing for position at the time, as Kenseth was nine laps down on Logano. Kenseth originally blamed prior damage from an earlier accident as to why his car went into Logano’s, but NASCAR did not buy that excuse and parked him for the remainder of the race. After today’s ruling on the incident, he will remain parked for the next two Sprint Cup events at Texas Motor Speedway and Phoenix International Speedway. Based upon our extensive review, we have concluded that the No. 20 car driver, who is no longer in the Chase, intentionally wrecked the No. 22 car driver, a Chase-eligible competitor who was leading the race at the time. The No. 20 car was nine laps down, and eliminated the No. 22 car’s opportunity to continue to compete in the race. Additionally, we factored aspects of safety into our decision, and also the fact that the new Chase elimination format puts a premium on each and every race. These actions have no place in NASCAR. NASCAR states that this is a behavioral penalty (violating sections 12.1 and 12.8 of the rulebook), and Kenseth will remain on probation for his actions for the next six months. Danica Patrick was also penalized under the behavioral penalty rules as Kenseth (sections 12.1 and 12.8) for an on-track incident with David Gilliland where she intentionally ran into Gilliland’s car after he had sent her into the wall earlier. Patrick was fined $50,000, will lose 25 series driver’s championship points, and will remain on probation through the end of the year. What we’re not going to do is take the style of NASCAR and parlay that into something where one driver or another believes the way to pay back somebody for something that happened is to take matters into their own hands. Obviously we won’t be accepting that. The most important thing is the way to pay drivers back is to race them hard. [...] What happened on Sunday, that’s not quite the way we would have liked to have seen that turn out. As Logano is currently a competitor in the playoff-style Chase for the Sprint Cup, Kenseth taking him out at Martinsville had serious implications on his ability to make it into the championship deciding final round at Homestead-Miami. Logano ultimately finished 37th this weekend, which will force him to win at Texas or Phoenix to gain entry into the final four shoot-out of the Chase. There’s going to be contact and there’s going to be somebody who had a lot on the line [such as] in Matt’s case in Kansas where you just simply get the absolute short end of the straw, and we hope that never happens, but that is going to happen. Matt Kenseth will be back for the season finale at Homestead.